Even in today's age of air transport, trucks and automobiles, the railroad still holds a place in the hearts of many, and while it is true that there are many historical and socioeconomic reasons for this, a very large reason that people still love to travel by train, I believe, is due to one simple truth. There is no better method of transportation for seeing the amazing natural beauty of the US. Indeed, the railroad companies realized this early on, as well as the potential economic benefits of tourism, and were an integral part of the creation of National Parks as we know them today. A railroad line doesn't even have to exist anymore to become an amazing place to visit, as railroad lines naturally lend themselves to the curious, the explorers, and the historian. 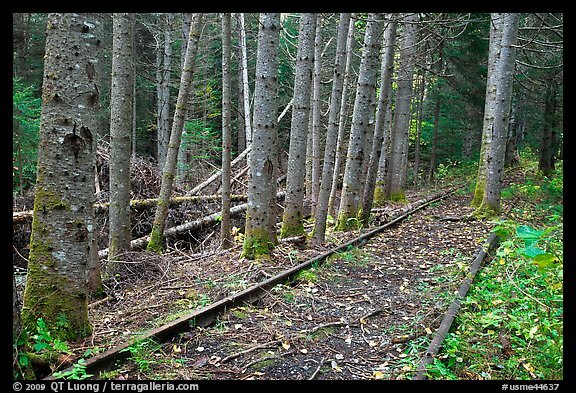 With that thought in mind, here are 6 abandoned railroad destinations that everyone should visit at least once. The Milwaukee Road Pacific Extension, abandoned in 1980, traversed some of the most beautiful and challenging areas in the United States. The abandonment begins in Terry, MT, and continues almost entirely uninterrupted to Renton, WA, with only a few spots of the line still active today. 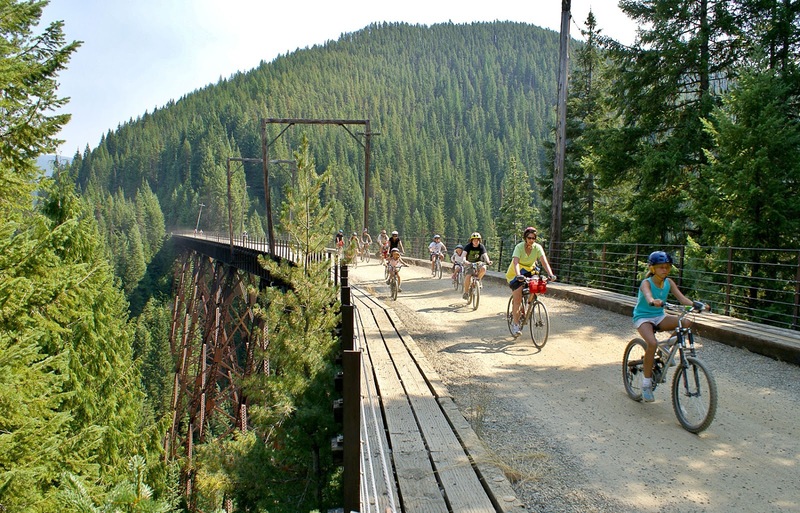 This trail begins in East Portal, MT and continues westward for 15 miles into Idaho, traversing through many trestles and tunnels along the way. The best part is that the ride is a slow bike ride downhill, and shouldn't be too challenging for most riders, allowing people from all walks of life to see the amazing views of the Couer d'Alene National Forest. The scale and beauty of this trail would be impossible to replicate in text; even video doesn't do it justice, this is something I cannot wait to ride for myself! Nonetheless, there are plenty of YouTube videos of people riding the trail, my favorite of which is below. 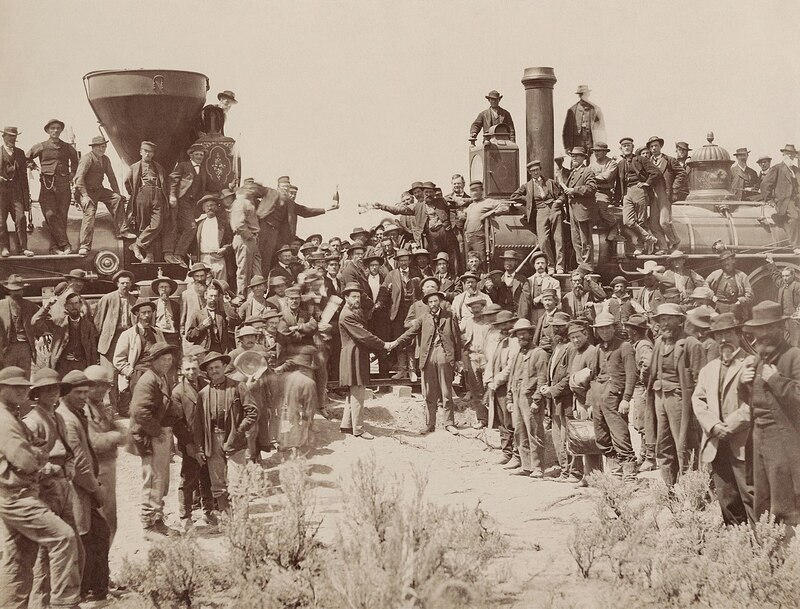 Located about 45 Miles Northwest of Ogden, Utah lies the Golden Spike National Historic Site, where on May 10th, 1869, the "Last Spike" of the Transcontinental Railroad was drove in. The name "Transcontinental Railroad" is a bit of a misnomer, since it was actually two railroads, and since the line actually terminated in Omaha, NE, requiring a ferry to transport one to eastern railroads. Nonetheless, the event symbolizes the westward movement and progress of the 19th century perhaps better than any other. Despite the history of the railroad line, it was actually abandoned relatively early. The US Government was offering both the Central Pacific and Union Pacific funds per mile of railroad constructed, meaning that they actually built two parallel railroad grades despite only one being necessary. This meant that Union Pacific's grade was abandoned in 1870. Central Pacific, later Southern Pacific, would run the line until 1942, when a line was built over the Great Salt Lake at the Lucin Cutoff. Despite this fact, both grades are quite visible, given the desert terrain of the route. 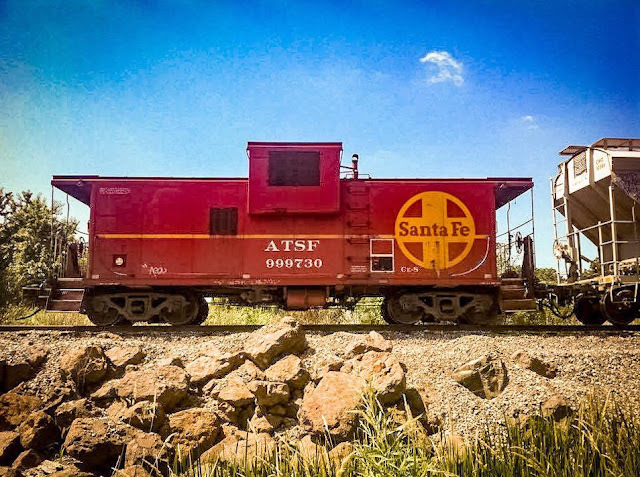 Today, the site is run by the National Parks Service, who do reenactments every May 10th, as well as have steam engines from the time period on display. They also a fantastic job of preserving and researching the history of the route, the workers, and it's impact to society. 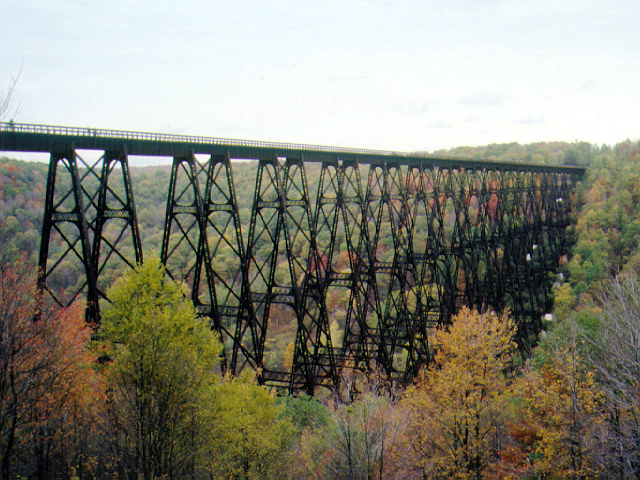 The Kinzua Bridge was a railroad trestle in Northwestern Pennsylvania over the Kinzua Creek. It was over 300 feet tall and 2,000 feet long, and was the fourth tallest railroad bridge in the US. Built by the New York, Lake Erie & Western Railway, which later merged with the Erie Railroad, it was in service until 1959. In 1963, Pennsylvania acquired the bridge and turned the area into a state park. Certainly, one of the tallest railroad bridges in the US would be interesting enough, right? Well, Mother Nature had plans for the bridge. On July 21st, 2003, a tornado struck the valley. Half of the bridge collapsed in the tornado, an F1 storm. Thankfully, no human deaths or injuries were reported, but the Kinzua was half destroyed. Facing a $45 million cost of rebuilding a defunct railroad bridge, the state of Pennsylvania left the destruction in place, and created something amazing as a result. 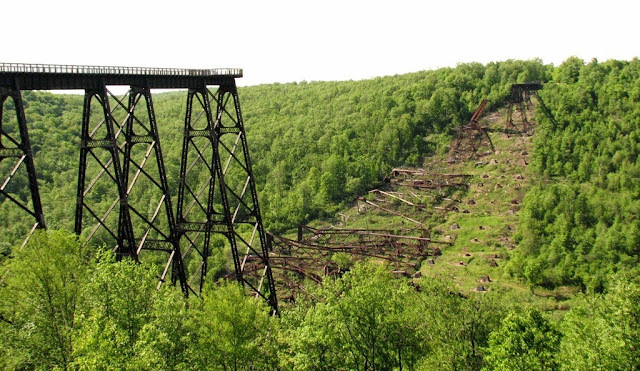 Intended to show how destructive nature can be, the Kinzua Bridge Skywalk now offers views of the destroyed structure, and allows users to walk the half of the 300 foot tall bridge, and even has the railroad tracks in place from it's days as a railroad bridge. I am very excited to say that I will be visiting this bridge next week on vacation, so expect an entire blog dedicated to the bridge in the coming weeks. I've already experienced, and blogged about, The High Line, which is designed to tell a story of a city's adaptation over time, from an industrial and working class past, to a decline, and a rebirth in the early 2000's as a tourist destination. The line was built in the 1930's, although trains were running the route since the 1880's, although at street level, causing numerous accidents and deaths, and requiring flagmen to run in front of oncoming trains to warn people to get out of the way. In 1980, the last train ran along the route, delivering Thanksgiving turkeys. It remained out of service for roughly thirty years, passing on from it's builder, New York Central, onto Penn Central, Conrail and finally CSX Railroad. The line had been an unofficial walk for some for a time before it's transition to a walking trail, although users would have been trespassing on private property. The High Line offers what many other railroad lines offered; a unique view of the landscape that you can get nowhere else. New York is an incredible place (although not as incredible as Chicago, as this Chicagoan must always make known), and the view the High Line offers once again cannot be adequately shown in pictures. I do not say it lightly that the High Line is my happy place. 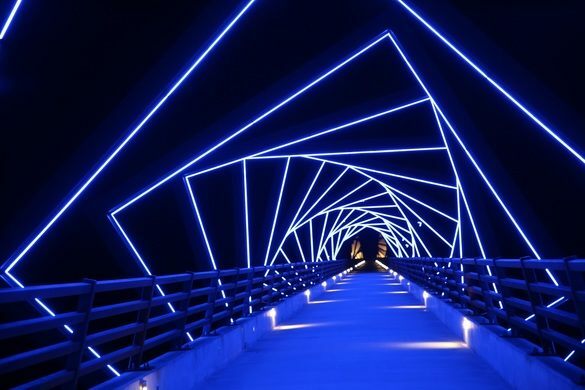 The High Trestle Trail is a 25 Mile long rail-trail running through rural Iowa from Perry to Slater, along one of that State's large amount of abandoned railroad corridors. So how are railroad trails supposed to stand out from their peers, given how numerous they are, especially in Iowa? The Iowa Arts Council was responsible for the steel beams along the bridge over the Des Moines River. This is one of the more creative ways at preserving history on a rail trail. In this case, the beams are intended to be a reminder of Iowa's mining history, as riding through them is supposed to resemble descending into a mine shaft. To me, at night, the almost psychedelic lighting of this trail invokes memories of driving and seeing neon signs all over the road. Of all the destinations on this list, none are harder to get to than this, and may represent the magnum opus of abandoned railroad lore. 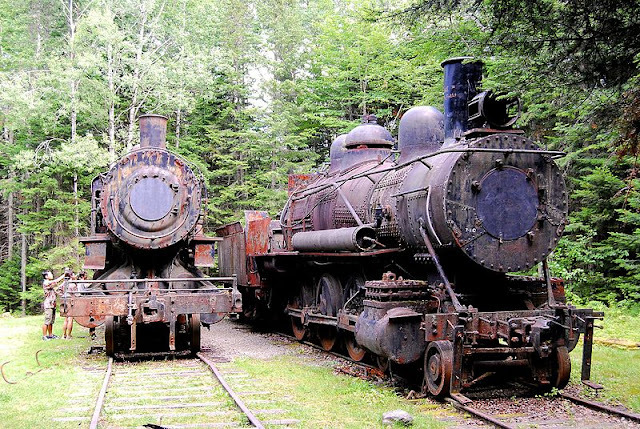 The Maine Bureau of Parks and Lands says it best, "there are not a lot of places in the world where you can be hiking through a remote wilderness and suddenly stumble upon rusting locomotives." Located in rural Northern Maine at the south end of Eagle Lake, what exactly are two rusted out, turn of the century locomotives doing here, of all places? They are a relic of logging operations that occured not just in Maine, but in many forests across the United States. The Eagle Lake and West Branch Railroad began operations in 1926, logging the area and transporting the logs along their tracks down to Umbazooksus Lake, 13 miles south. The remoteness of this operation made maintenance and energy delivery for these locomotives difficult to say the least, which is documented well in the link above. The Great Depression would put an end to the railroad. Instead of selling, or scrapping the locomotives, it was deemed too expensive to do anything but leave them in place. They were initially stored in a shed, although it was destroyed in the time between the end of operations and when the State of Maine would take over the site. In 1995, some components of the engines were removed by the state, and the locomotives were painted to prevent further rusting. They remain alone in the wilderness, waiting to be discovered by anyone who can brave the terrain to find them. Many YouTubers have vlogged their own experiences finding the locomotives, one is shown below. As always, thanks for reading, and let me know if there's any other abandoned railroad destinations you think people should have on their bucket list! If you ever find yourself for a walk at the Waterfall Glen Forest Preserve in southern DuPage County and listen closely, you can often hear the sounds of trains rumbling by. 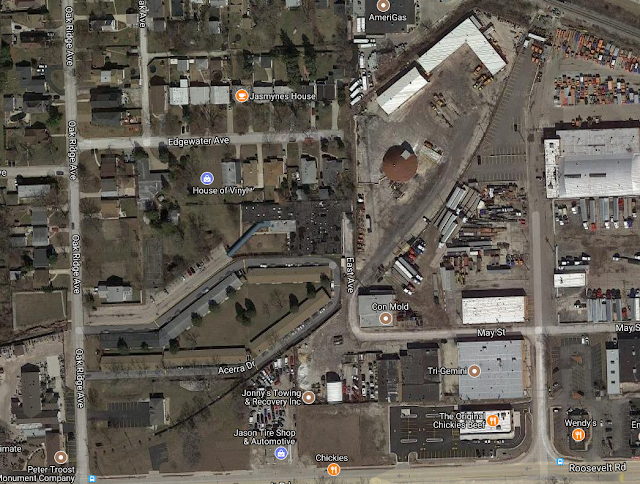 The very busy BNSF Chillicothe Subdivision lies just to the south. Additionally, a spur line from the Chillicothe goes through the western park of the Preserve, serving the industrial area to the west. But, upon further inspection, if you look closely at the trail in the southern part of the Preserve, you may notice that there are railroad tracks much closer than you might think. No need to worry, however, about a train barreling down these tracks. 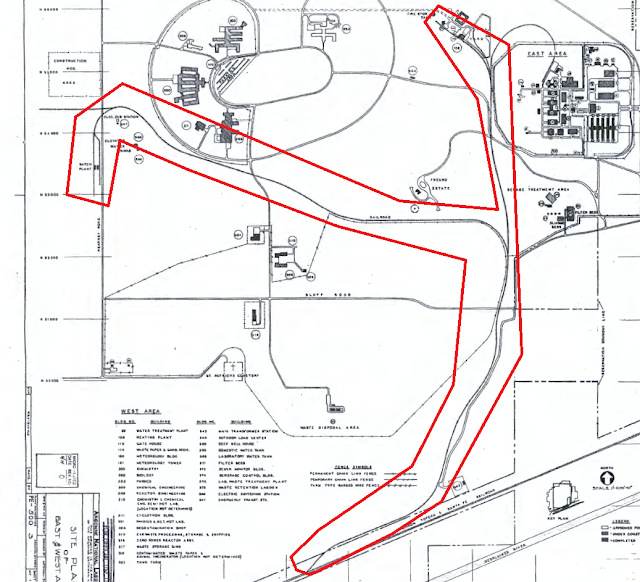 These tracks, which spurred from the Chillicothe Subdivision (at the time owned by the Atchison Topeka & Santa Fe Railway), were constructed in the 1950's, when Argonne National Laboratory was moved to it's current campus, after having been formerly located within the University of Chicago. I first discovered these tracks in 2012. As I very much love hiking around Waterfall Glen, I kept running into them, and eventually my curiosity piqued, such that I contacted Argonne and the Forest Preserve District of DuPage County to see if they knew why railroad tracks were running into Argonne, and what, if anything, they transported. My guess is they never transported Weed Whackers. According to an email from Argonne Historian Dan O'Rourke, "The tracks which entered the site along Railroad Drive were installed in the late 1940s and were used to bring in the construction material needed to build the lab." There actually existed two spurs, which I was unaware of, as I was unable to follow the tracks inside the fences at Argonne. According to O'Rourke, the lines were abandoned by the 1980's. While there are no specifics onto what, if anything the line was used for, outside of transporting construction materials, the railroad spur is mentioned in the 1972 Environmental Impact Statement for Argonne, which may be a reason why the tracks were never torn out. According to the Impact Statement, the land was being proposed as a potential industrial development. This would have been before the Forest Preserve District of DuPage County bought the land, converting the entirety around Argonne into the Waterfall Glen Forest Preserve. So now you're probably all thinking, how does one find these tracks? Take the road (seemingly) less traveled, of course. You can enter the Forest Preserve from Cass Ave and Bluff Road. Bluff Rd west of Cass is fenced off for cars, but is accessible on foot, leaving an otherwise abandoned road as your walking path. Before the creek, there is a path which connects to the actual Waterfall Glen Trail, as well as the Rocky Glen Trail, which will allow you to view the waterfall and explore the rest of the preserve. Beyond the creek, the road forks, take the southern fork. This will become obvious as the fence barring entry into Argonne is quickly seen to those taking the northern fork. The road is in rough shape, but more than suitable for a hike. After a half mile or so, you will hit a 4 way intersection at Bluff Rd and Railroad Dr. Railroad Dr is aptly named, as this is where the railroad tracks are. Following Railroad north or south will allow you to see evidence of the past embedded in the trail. Be aware though, at first glance, there isn't much. You really have to keep a close eye out. My best advice is to go in the winter time when there is no snow on the ground, as the brush makes the tracks quite difficult to spot in the summer months. In spite of that, my photos were taken in August '17 and June '18. The tracks become much clearer at the southern end of Railroad Dr by the active Argonne Switcher line. Here, the track leaves the brush and enters the trail surface, right before the Argonne Switcher. This is just south of the Waterfall Glen's Main Stem, but accessible on foot. The tracks end here. But the line crossed the Argonne Switcher and connected with the Chillicothe Subdivision, a little ways west from here. Looking north from Bluff Rd on Railroad Dr toward Argonne's entrance. Railroad spikes in the ground. Hey buddy! While there are spiders and snakes on the trail, they aren't numerous, and you shouldn't worry too much about crossing them. Do bring bug spray, as the mosquitoes are numerous. One can't go too far north without reaching Argonne's fence, and two "No Trespassing signs". As Argonne National Laboratory is fenced off and government property, this is where my photos end. A special thanks to both the Forest Preserve District of DuPage County and Argonne National Laboratory for their quick responses to why exactly there were railroad tracks leading into the lab, and a thanks to you as well for reading! Most people in Illinois are familiar with the numbered route system, for one reason or another. Maybe they curse I-290 on a daily basis, or want Route 53 built already! Regardless, a road's name and number are typically an interchangeable way of describing it in this state. 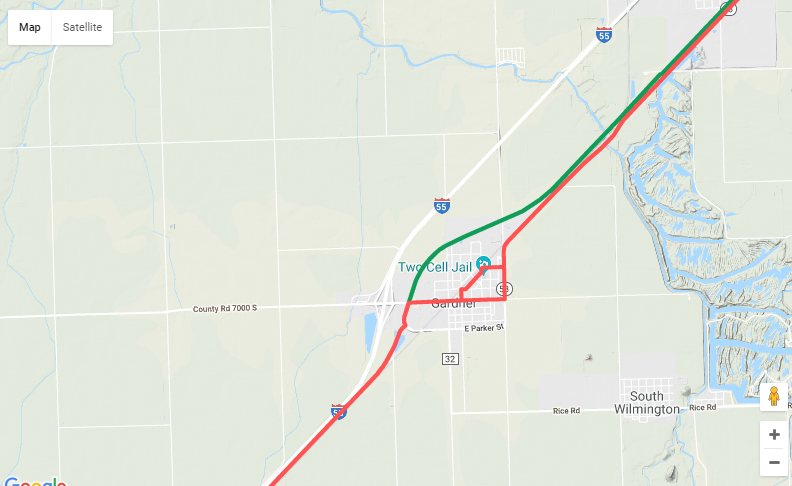 Illinois, like every state, has a numbered route system, consisting of highways that are maintained by the state, or more specifically, the Illinois Department of Transportation, (IDOT). For example, most of Illinois Route 21 is known as Milwaukee Ave, and either are acceptable and easily understood by most people. The State Route system has been around since 1918, and just like the roadway network, it has expanded, grown, and changed over time. As US Routes were added, state routes were sometimes decommissioned, and as the Interstate Highway System came to fruition, even more changes occurred, and continue even to this day. While routes are continuously upgraded and moved, the roads that they once traversed are fixed in a finite location. 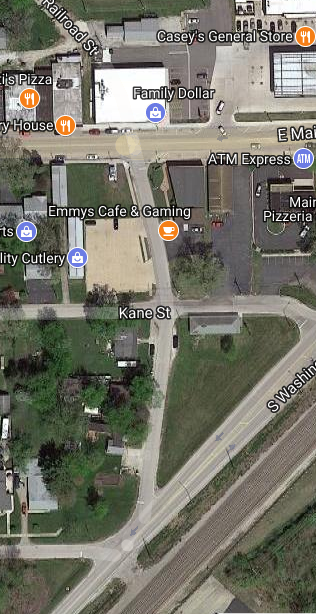 Thus, in one example, there are no less than four roads in Gardner, IL which were once formerly part of US Route 66. So what happens to the old road after a new road is built? It is rarely abandoned entirely, as usually the old road still serves a purpose to the local community. In some cases, it becomes a brand new state highway. That being said, giving a new number to an old road every time one is upgraded would require an insane amount of numbers, so in many cases, an old road that is still part of the state highway system gets no number whatsoever. 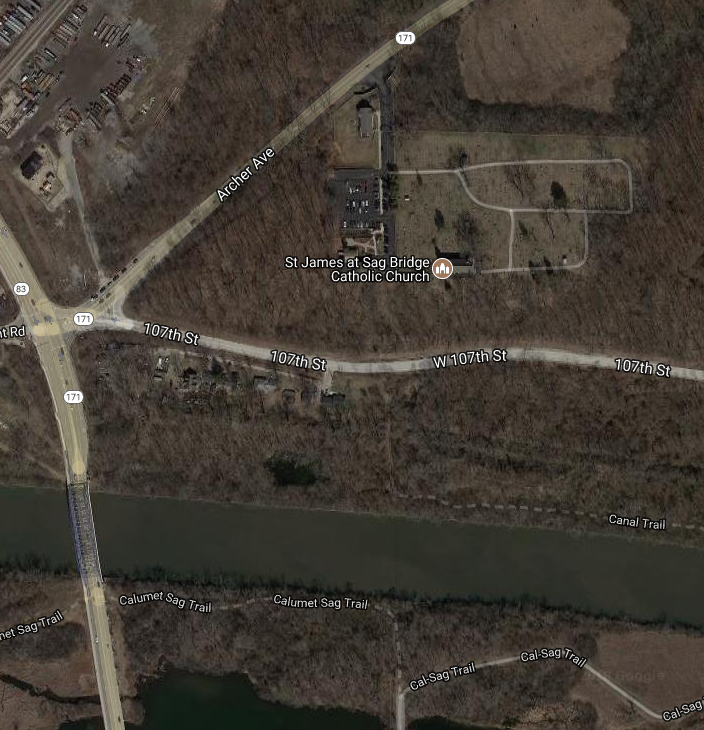 IDOT refers to these roads as "Unmarked". 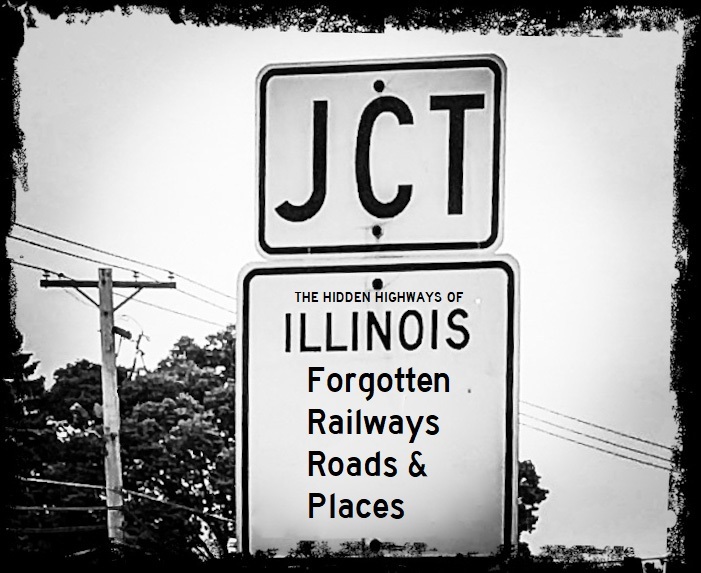 IDOT does not say a whole lot about this highway system of roads hidden in plain site. 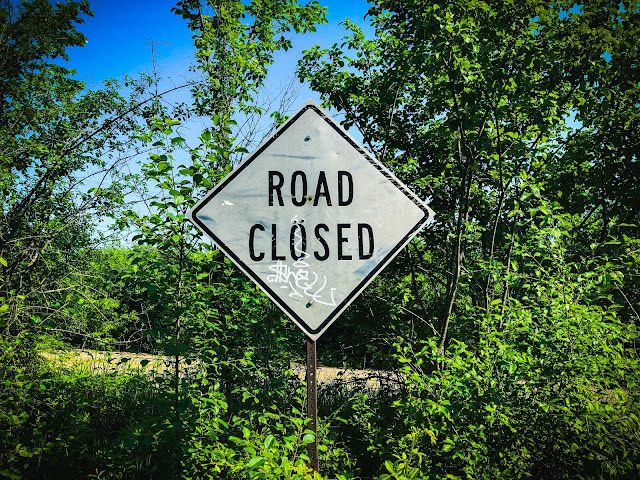 IDOT only briefly states that "Unmarked Routes are those roadways that are not designated by Interstate, US, or Illinois signage." But here's where things get interesting. There are unmarked state highways in all corners of the state, and they are not simply just old alignments of current state highways. There are some major roads that have no number at all, such as Palatine Rd, Sheridan Rd, and many of the former alignments of Route 66. In fact, there are many examples of unmarked routes which are significantly longer than some posted routes! 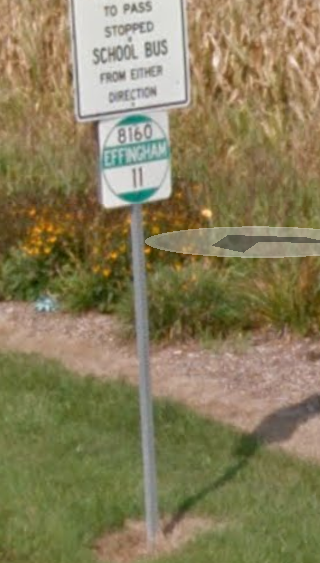 Confunding the confusion, despite the fact that these roads have no posted numbers, they are definitely numbered. 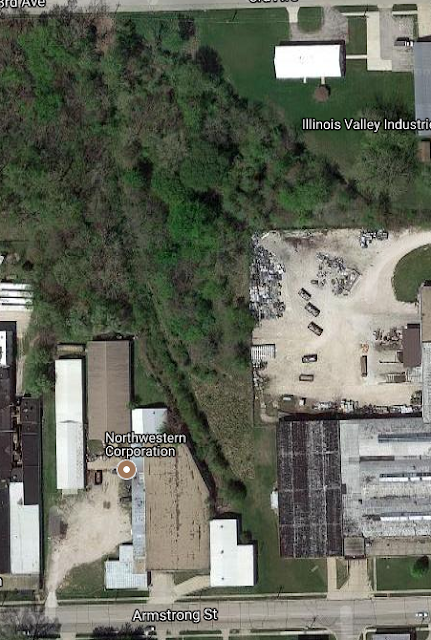 These "unmarked" roads are given a hidden number only used internally by IDOT, which occasionally gets leaked out. In some cases, a road that used to carry a number, but now does not, will be referred to by it's former number but not posted. For example, Midlothian Road between IL 176 and Lake Zurich is Illinois Route 63, a number that was discontinued in the 1970's, but is still referred to as such internally by IDOT. Sometimes, these numbers are unintentionally leaked. In Coles County, IL 316 used to be signed between Charleston and Mattoon, IL, and while no longer signed, is still Route 316. The marker above is considered a reference marker, showing a mile marker, the route number, and the county. 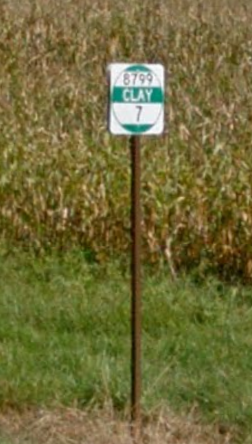 It is not an official Illinois Highway Marker, and is only meant for internal IDOT record-keeping, and to a lesser extent, police and fire agencies. A few other of these routes have made it onto reference markers. I have discovered about 400 different hidden highways in Illinois, using IDOT's gettingaroundillinois.com, and County Highway Maps, including CookViewer, which is extremely helpful, given just how many of these hidden routes exist in Cook County alone. I created a map of what I found, but just like when it comes to abandoned railroads, I know there're more to be added. As an exercise in futility, I gave numbers to every hidden route I could find, or used the number IDOT uses to describe the route, if I know it. 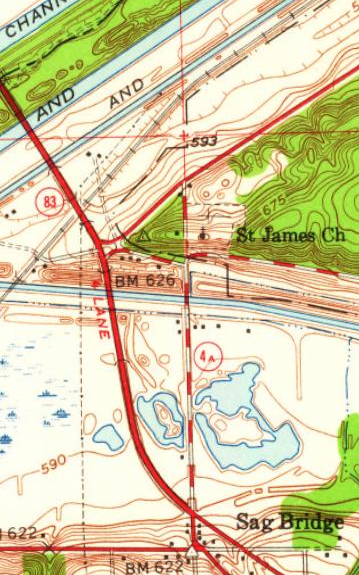 Unfortunately, I do not believe that an official map of the entire unmarked state highway system exists, and perhaps more unfortunately, if it does, it is buried deep in the labyrinths of IDOT's records. 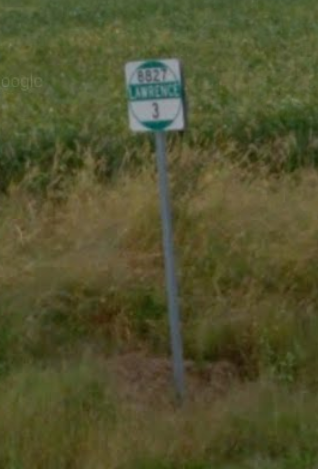 Additionally, using Google Street View, I have found a few examples of reference markers showing the hidden number of a road, all of which are in rural downstate Illinois. Bill Burmaster lists examples of reference markers that he has discovered as well. 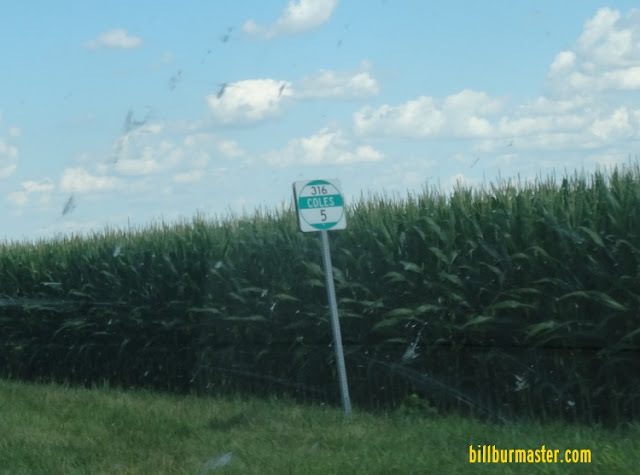 IL 8160 is one of the longest hidden roads in Illinois, and the longest that is not a former route, running for 41 miles between IL 121 and Clay City, IL. The only official road name I could find is "Dieterich Blacktop", which makes sense, as the route cuts through Dieterich. Why it was never officially numbered is beyond me, as there are a ton of roads in IDOT's system that are shorter than 41 miles. Running between Kinmundy and Louisville in southeast Illinois for 18 miles is another oddity, which made it's way onto reference routes but was never given a number for some reason. IL 8827 is a former alignment of US Highway 50, which was moved to a route north of the old road a long time ago. 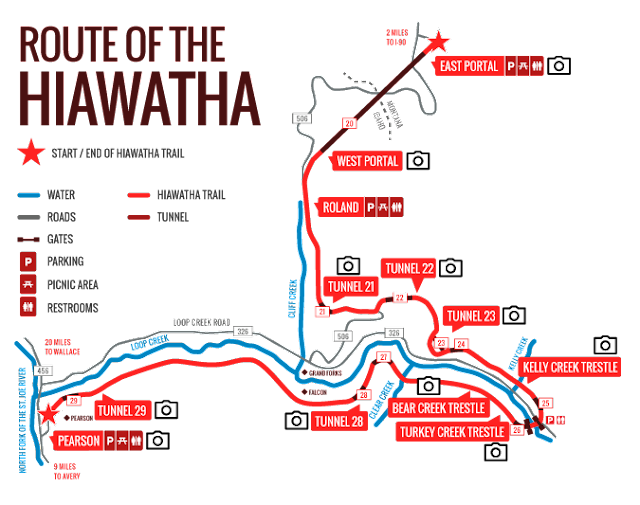 It runs east of Lawrenceville nearly to the Indiana State Line for about five miles. If anyone knows more about IDOT's hidden highways and reference routes, I would love to hear from you in the comments. In the past, I have attempted to find information about them from IDOT with little luck. All of the data on them is publicly available as far as I know, but widely scattered in IDOT and County Jurisdictional documents. But I suppose that's part of the fun, discovering something about the world around you, hidden in plain sight. A few months back, I posted a blog showcasing some examples of architecture built around what is now abandoned railroad lines, i.e "Scarchitecture". Thanks to the magic of Google Maps, it is now quite easy to find examples of this phenomena in all parts of the world. 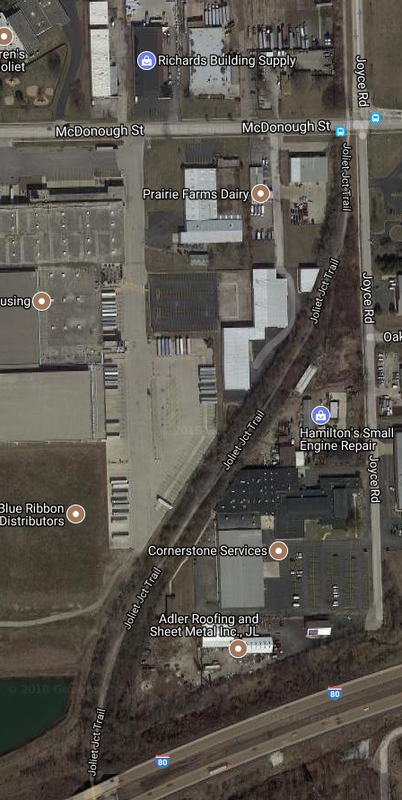 It is generally easier to find examples of scarchitecture in major cities like Chicago, but it's suburbs have a significant amount of interesting examples as well, especially the older, more industrial areas. 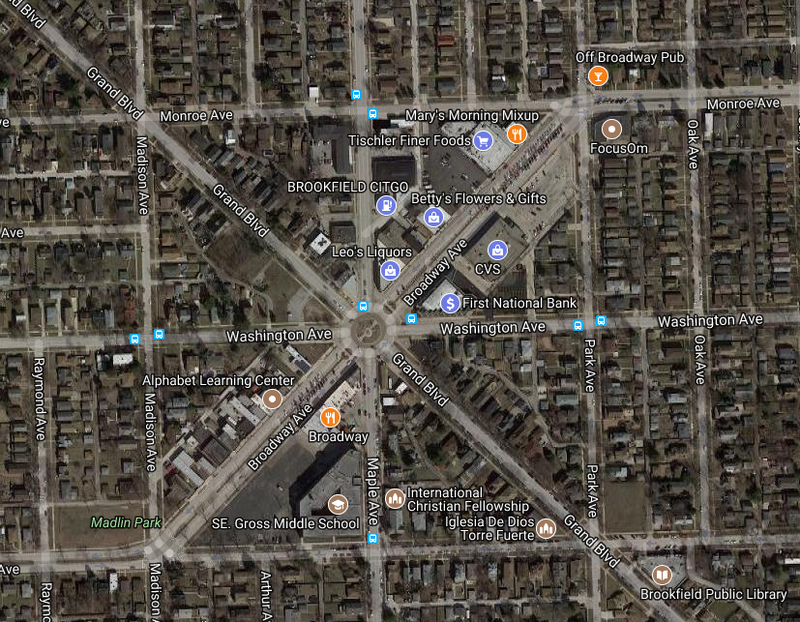 Thus, for today's blog, I decided to revisit the concept of scarchitecture and find examples of the phenomenon in the Chicago suburbs. The Aldi at the corner of North Av & Addison Rd shows the remants of the Addison Railroad, constructed at the beginning of the 20th Century, which ran from this spot, up Addison Rd, and ended a couple miles north, just north of US-20. The Addison Railroad was quickly bought by Illinois Central Railroad, and remained active up until around the 1970's. Much of the Chicago Aurora & Elgin Railroad is today's Illinois Prairie Path, however there are some sections which weren't suitable for trail construction, such as the area above. In this case, the property line between the former right-of-way and the area to it's south is quite visible in satellite views. 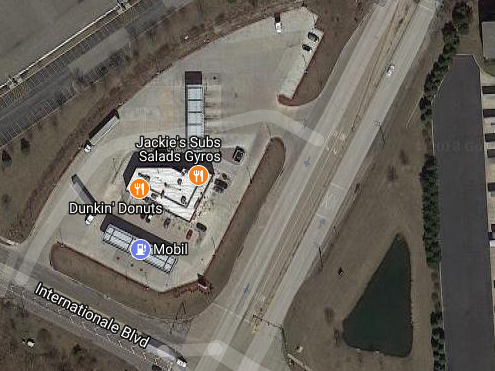 The Mobil Gas Station here is a recent addition to the area, opening in 2015. In it's parking lot, the boundary between the abandoned Bolingbrook spur and the property line is quite visible. 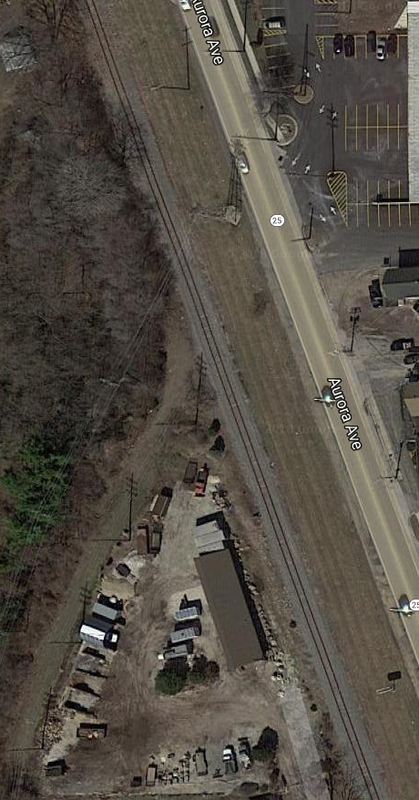 In this case, the railroad tracks are still there, but no activity has occurred on the railroad in over 20 years. The existence of a long abandoned railroad is hinted here with "Railroad St" immediately southwest of "Round House St". As best I can tell, the railroad line that once ran through here has been abandoned since at least 1939 according to topographical maps, and yet, one can still see traces of the railroad in both the positioning of the road, and how the building in the center of the frame is parallel to Railroad St, and not a more common rectangular shape. The Chicago & West Towns Railway was a streetcar system, serving the near Western Suburbs of Chicago until 1948. Running in the middle of Broadway Ave, the remnants of the route can still be seen in the large right-of-way that occupies the center of the road, despite the streetcar not operating for 70 years. Due to it's proximity to two large railyards, Franklin Park has a ton of railroad activity. 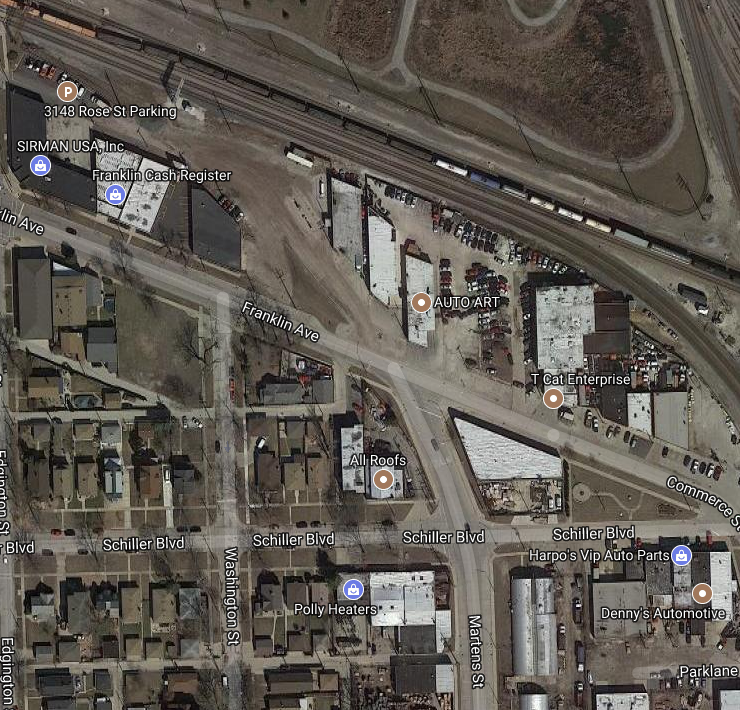 A look on Martens St at Franklin Ave shows it used to have even more, as it was once a connecting railroad between two yards on the former Indiana Harbor Belt Railroad. Mt. Carmel Cemetery was once served by the Chicago Aurora & Elgin Railroad. The line's primary service was for funeral trains, although it was also served as a stop between the cemetery and the main line at Bellwood, IL. Trains stopped serving the cemetery in the 1930's, yet satellite imagery still holds clues to the existence of this once gravely stop. One of the reasons for the closure of the Mt. Carmel line was aside from the cemetery no longer wishing to be a stop on the Chicago Aurora & Elgin, another branch line existed immediately east, this one serving Westchester, IL. This line was intended to extend west and eventually become the divergence point for trains running to Aurora. That never happened, as the Great Depression had a significant impact on the profitability of the line. 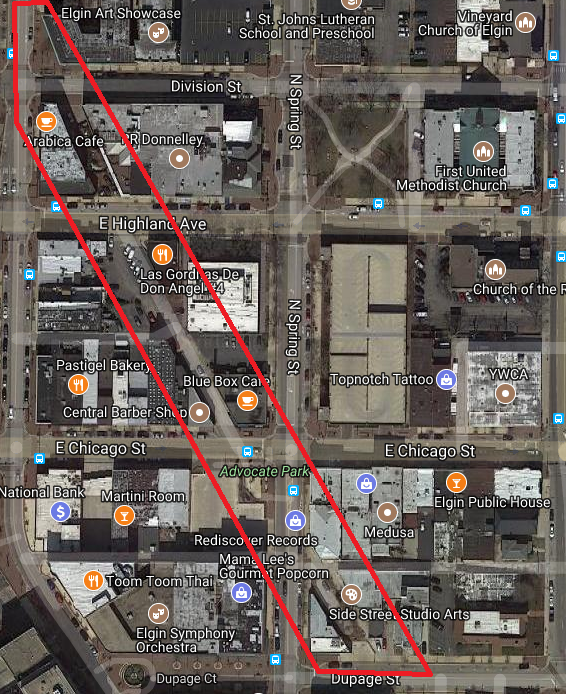 While this line would survive longer, it too would be abandoned and leave a significant amount of scarchitecture still visible today. The Jewel at Mannheim and Cermak Rd was built within the former right-of-way. The Joliet Junction Railroad used this right-of-way from 1994 to 1999, itself taking over operations from the Elgin Joliet & Eastern Railway. Much of this has been converted into the Joliet Junction Trail, and although the section here is not trail, it's quite visible that there was once more than currently meets the eye in this area. 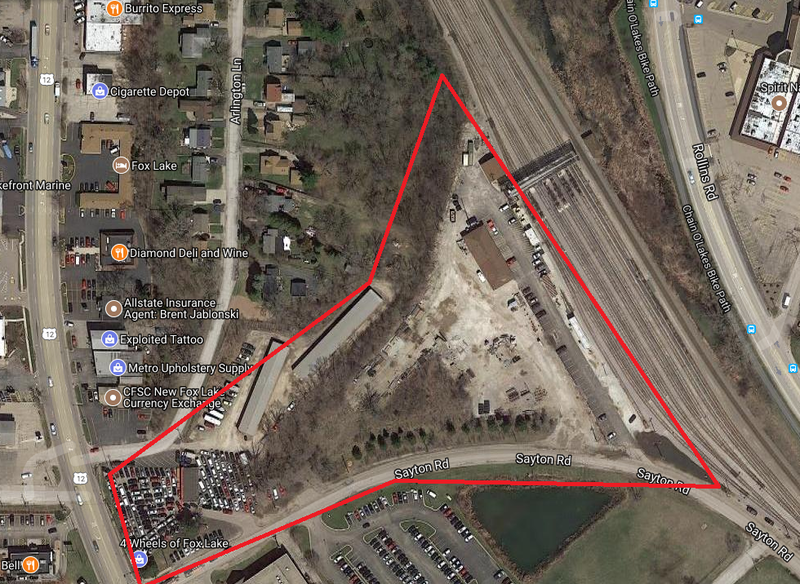 Another piece of scarchitecture associated with this line comes at it's south end in Rockdale, IL near I-80, as the parking lot of Blue Ribbon Distributors as well as Cornerstone Services are both built at angles matching the former right-of-way of the railroad. 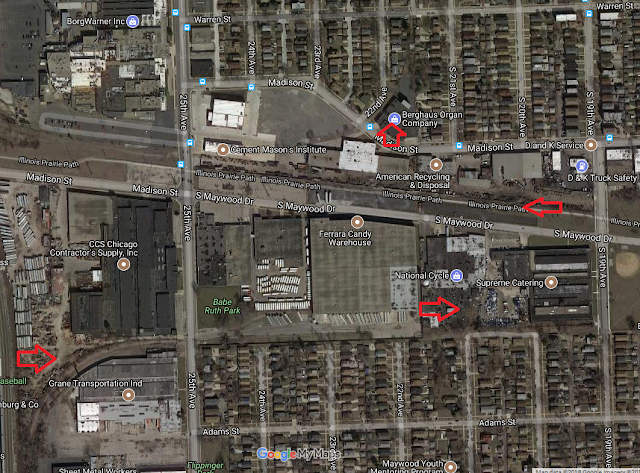 About mile north of Bellwood lies more examples of industrial decay in Melrose Park. 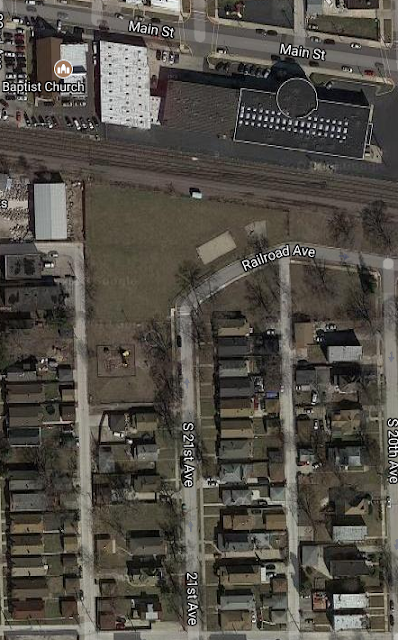 The spur from Bellwood ran between 21st and 22nd Avenues. The houses which are now within the former right-of-way appear to been less densely built than those immediately east or west. The remnants of a long lost Rock Island spur are nonetheless kept alive by the Northwestern Corporation building in Morris, IL. 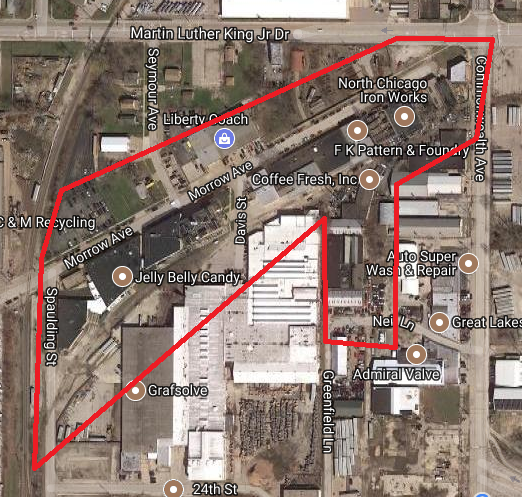 North Chicago, IL has an interesting railroad history, as near MLK & Commonwealth, the Elgin Joliet & Eastern Railway had an industrial spur line that isn't used anymore, although all the buildings near here show some examples of it's past. 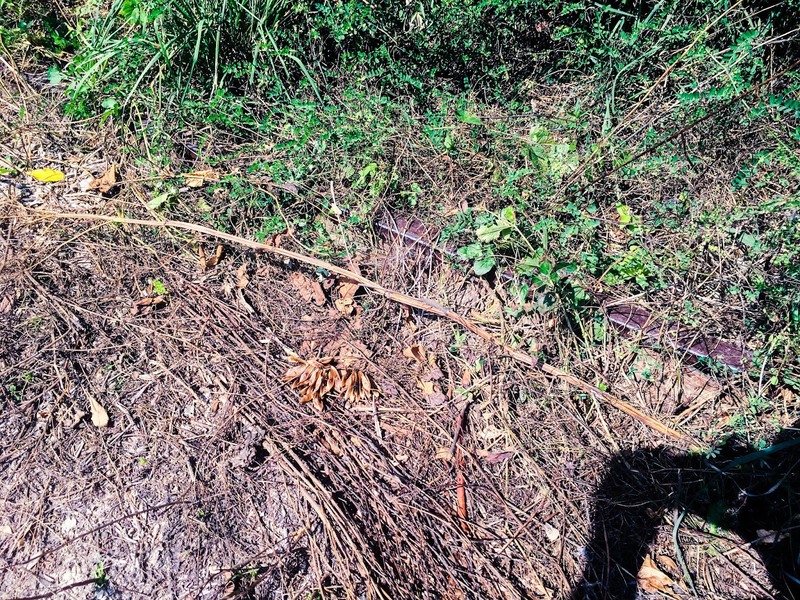 There are a few pieces of railroad track in various sidings, although none have been used in recent times. 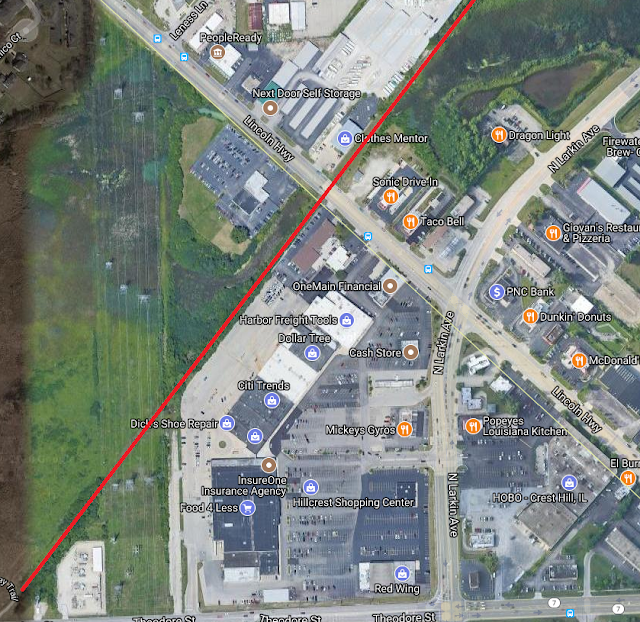 This is also where the EJ&E intersected the abandoned North Shore line, which ran along Commonwealth Ave before turning east, using the right-of-way of today's Bobby Thompson Expy. Up until 2012, Illinois Central (CN after 1995) had a railroad spur which began just south of North Riverside Mall at the main line and extended north to Forest Park, IL, immediately west of Harlem Av. 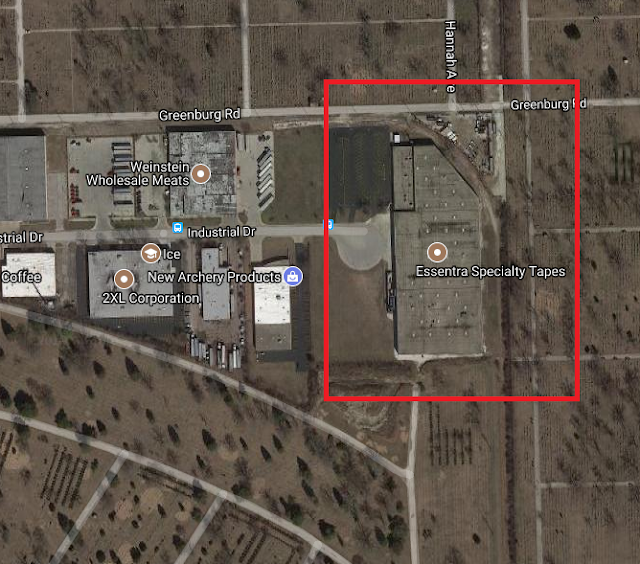 As a result, what is today Essentra Supply Tapes still has a great example of scarchitecture on it's northeast corner. This example of scarchitecture isn't related to the railroad, yet it was interesting enough to talk about. St. James is the oldest continuously operating church in the Chicago area, in operation since 1833. As such, it has predated both the automobile and railroad industry in Illinois. One of the odd things about this church is that has an extremely long parking lot, relative to it's size. Why is that? The answer is that it's parking lot used to be Archer Ave (the former IL-4A). Before the current IL-83/IL-171 bridge was built, drivers would have to use the decommissioned bridge along IL-4A, which later became IL-171 in this area. The 4 lane bridge that exists today carries both IL-171 and IL-83, and has been in use since the 1950's, leaving St. James as the only business on the former route. The Chicago & Northwestern Railway once ran through downtown Elgin, and this legacy is quite evident today. 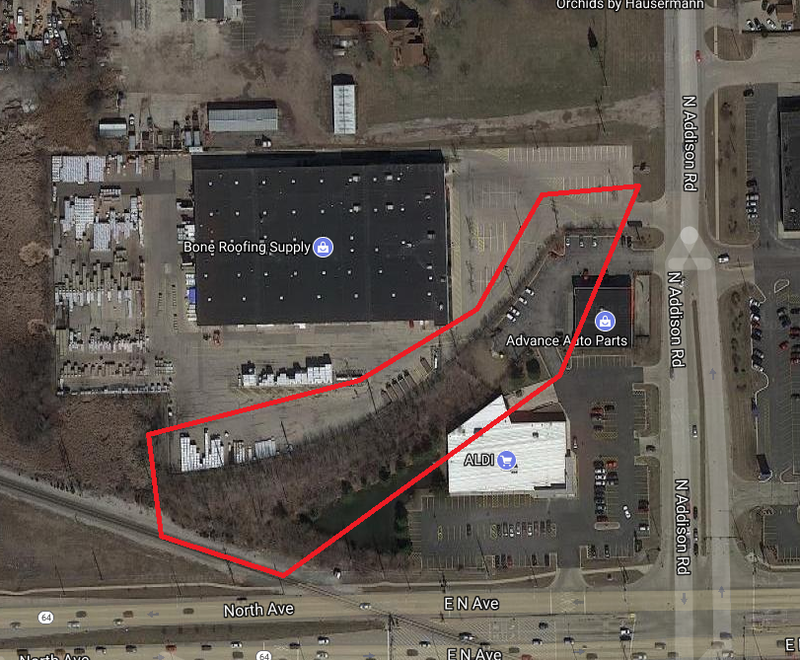 A line of odd-angled buildings exists between DuPage St and Grove Ave. Northwest of here, the Prairie Trail runs along the Fox River all the way to Richmond, IL. This particular stretch of railroad was abandoned in the 1990's. Finally, we come to what looks to be a Wye in Fox Lake, IL, immediately south of the end of the Milwaukee District North Line. This line is a remnant of the Ice House Days before the advent of refrigeration, and ice would be transported via railroad from Fox Lake (as well as many other lakes in the region). The line used to run all the way to the lake, but was truncated after the 1920's. This particular stretch east of US 12 would be used by the Milwaukee Road up until the 1970's, and still leave a mark of it's existence which can easily be seen today. As with all my blogs, and with railroad history in general, there exists far too many examples to discuss fully in one blog, and I know I missed some examples of scarchitecture that exist in and around Chicago. Let me know if you know of any you'd like to share in the comments. As always, thanks for reading!